For more information on collections of recyclables, yard waste, and refuse, please click on the above links or contact the Streets Department. Mondays & Thursdays – south side of Rehoboth. Tuesdays and Fridays – north side of Rehoboth including the Schoolvue area. Mondays – South side of Rehoboth. Tuesdays – North side of Rehoboth including the Schoolvue area. The City of Rehoboth Beach has renewed a three-year recycling contract with Blue Hen Dispose-All. The new schedule is a weekly pickup every Friday from May through September, and every other Friday from October through April. To ensure your recyclables are picked up, please place your container curbside between 6 pm Thursday evening and 7 am Friday morning. Your container must be removed from the curb before 9 pm Friday evening. Blue Hen Dispose-All is not responsible for returning to the city to collect recyclables that were not placed curbside prior to 7 am. The city’s recyclables collection program, instituted in 2006, remains free of charge including providing free containers. The change in schedule was necessary to maintain costs and services for residents. We have heard from so many citizens that recycling is important to them, and the city is committed to continuing with recycling. Year-Round Hours of Operation are Monday, Tuesday and Thursday from 9 a.m. to 2 p.m. RESIDENTS must provide proof of residence showing local Rehoboth Beach address and driver's license. BUSINESSES must provide copy of current Rehoboth Beach business license showing physical location within city limits. The Recycling Center is monitored 24/7. Please note: All yard waste must be in proper containers or bagged / bundled and tied. Need to dispose of construction materials and hazardous Waste? 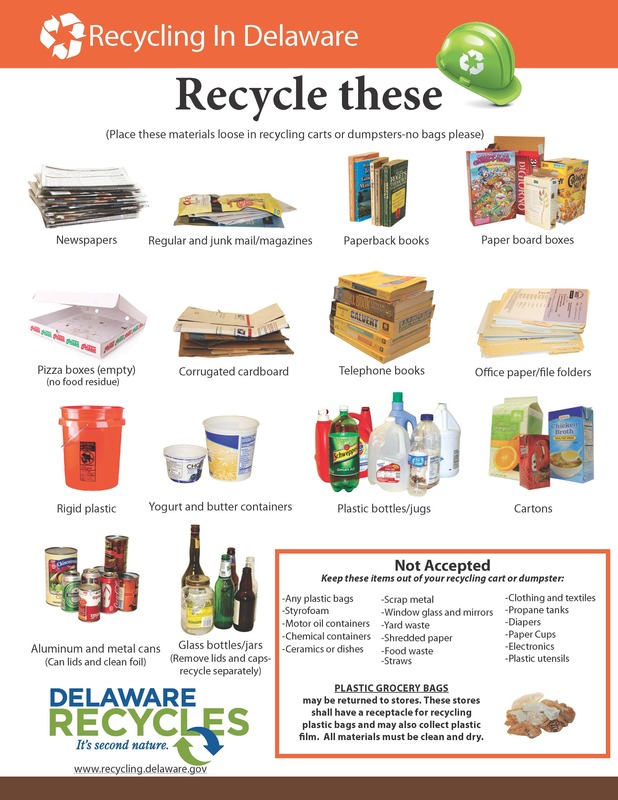 Contact the Delaware Solid Waste Authority at www.dswa.com or 800-404-7080.